It’s common for gardeners to experience muscle soreness after a long afternoon in the garden. General muscle soreness disappears in a few days, but many gardeners complain about chronic elbow pain. Gardener’s elbow can occur on the inside or outside of the elbow, presenting symptoms similar to tennis elbow and golfer’s elbow. The primary differences between these conditions are the location of the pain and the activity that leads to injury. However, both conditions are caused by overuse of the muscles and tendons of the forearm, leading to inflammation and pain around the elbow joint. This nagging problem is a form of tendinitis. Tendons are the ends of muscles that attach to bone. Because of the force of the muscle, the points of insertion of the tendon on the bone are often pointed prominences. The medical names, lateral epicondylitis and medial epicondylitis, come from the names of these bony prominences where the tendons insert, and where the inflammation causes the pain. The mechanism of this injury can vary from a single violent action to, more commonly, repetitive stress injury (RSI) where an action is performed repeatedly and pain gradually develops. The pain of gardener’s elbow is usually a result of repetitive flexion of the elbow i.e. lifting, carrying, weeding, digging, planting, shoveling, pushing a wheelbarrow, pruning. The injury typically occurs at the beginning of the gardening season, or when a specific gardening activity is increased in intensity or duration. Performing gardening tasks is one common cause of these symptoms, but many other sport- and work-related activities can cause the same problem and gardening tasks exacerbate the injury. Pain is the most common and obvious symptom associated with gardner’s elbow. Pain is most often experienced on the inside of the upper forearm, but can also be experienced anywhere from the elbow joint to the wrist. Weakness, stiffness and a general restriction of movement are also quite common, even tingling and numbness can be experienced. Perform thorough warm-up to help prepare the muscles and tendons for any activity to come. Without a proper warm up the muscles and tendons will be tight and stiff. Check out the Fit to Garden Warm-up practical guide (sign up for the Garden for the Health of It newsletter right here and receive my FREE Fit to Garden guides. Poor gardening ergonomics can certainly result in pain or injury. 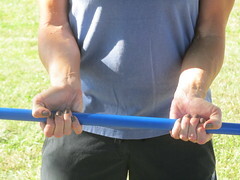 The use of everyday gardening hand tools can cause strain, and in effect be a major source of discomfort for many gardeners. The hands, wrists, and elbows are complex joint structures that are vulnerable to overuse injury and degenerative conditions. 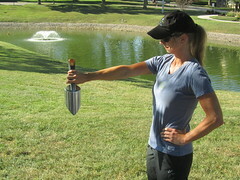 Check out the Fit to Garden Proper Biomechanics for Gardening Hand Tools article, Proper Gardening Biomechanics practical guide (sign up for the Garden for the Health of It newsletter right here and receive my FREE Fit to Garden guides). Flexible muscles and tendons are extremely important in the prevention of most strain or sprain injuries. When muscles and tendons are flexible and supple, they are able to move and perform without being over stretched. If the muscles and tendons are tight and stiff, it is quite easy for those muscles and tendons to be pushed beyond their natural range of movement. When this happens, strains, sprains, and pulled muscles occur. To keep your muscles and tendons flexible and supple, it is important to undertake a structured stretching routine. Check out the Fit to Garden Post-Gardening Stretches practical guide (sign up for the Garden for the Health of It newsletter right here and receive my FREE Fit to Garden guides). Unscrew the broom from a broom handle. 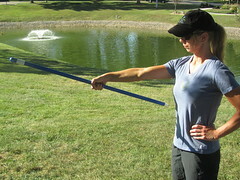 Hold the broom handle in the center with an underhand grip. Glue elbows into your sides and hold forearms parallel to the floor. 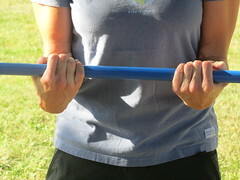 Extend your wrists to aim knuckles downward, then curl the broom handle so the knuckles are facing upward. 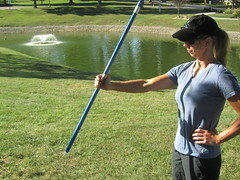 Extend the arm and hold the broom handle vertically at shoulder height. Tip your wrist forward with your thumb on top, then tilt your wrist toward you as far as possible without bending your elbow. Hold a broom handle or garden tool at shoulder height. Twist your wrist downward as if you’re pouring water, then twist your wrist upward as far as possible without moving your arm. Golfers elbow is a soft tissue injury of the muscles and tendons around the elbow joint, and therefore should be treated like any other soft tissue injury. Immediately following an injury, or at the onset of pain, the R.I.C.E.R. regime should be employed. This involves Rest, Ice, Compression, Elevation, and Referral to an appropriate professional for an accurate diagnosis. Please be sure to consult your physician prior to performing any of the stretches or exercises described here.